People take magnolia bark extract for a number of great benefits. These benefits include the potential to help reduce feelings of stress, promote healthy sleeping patterns, and maintain overall good health. Magnolia bark has been used in ancient Chinese medicine for over two thousand years. The Chinese used magnolia bark extract along with other herbs and active components for the treatment of a number of ailments and illnesses. These included treating the symptoms of emotional distress. It seems that the ancient Chinese knew about how to take Magnolia bark extract for stress, long before we did. Read more about it here! The recommended dosage for magnolia bark extract is around 250 – 500 mg daily, depending on your desired effects. If you’re looking to improve your sleep, a higher dosage of magnolia bark extract is recommended. People use a lower dosage for reducing stress and maintaining good health. Magnolia bark extract is fairly soluble in water. This means that you can take magnolia bark extract in a glass of juice or water. However, it might not dissolve fully. Most people say when they take magnolia bark extract dissolved in water, the taste is actually quite nice. A number of users have reported that the extract is a bit too strong to be taken under your tongue. You could give it a go, but it is very bitter this way, and we’d recommend rather taking it with water or juice. Another way that you can take magnolia bark extract is by adding it to a health or breakfast smoothie. You can easily mask magnolia bark's pleasant taste by adding other ingredients, so you probably won’t even notice it until the effects kick in. If you want to use magnolia bark extract as a mouthwash to kill bad breath, we’d recommend dissolving a measured scoop in a small amount water, and gurgling for up to 30 seconds (as if you were using any other mouthwash). Scientists have shown that magnolia bark extract is very effective at killing the bacteria that cause bad breath. Magnolia bark extract is an ancient herbal remedy and is a very safe dietary supplement. As with any dietary supplement, there is a possibility of a headache or other mild side effects. Most users do not report any negative side effects when they take magnolia bark extract. Magnolia bark extract may be unsafe for pregnant or breastfeeding women. Please consult your physician before using magnolia bark if you have any underlying medical conditions. Magnolia bark is a great calming, relaxing dietary supplement that can be used to promote healthy sleep and may reduce stress. Magnolia bark extract is great when used with other dietary supplements that are calming, as well as mood-lifting supplements. 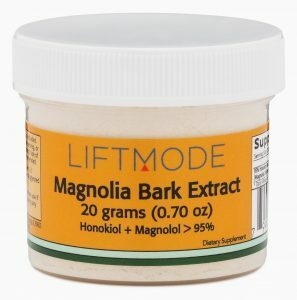 An example of a great magnolia bark extract stack includes magnolia bark with L-theanine, the active component of tea. Another great way to take magnolia bark extract is with 5-HTP or L-tryptophan, two dietary supplements that are great for improving your mood! Magnolia bark is a great dietary supplement that you can use to help relax and to promote healthy sleep. People often take magnolia bark in a glass of water or juice. The best dosage of magnolia bark extract is around 250 – 500 mg, depending on your desired effects. You can also use magnolia bark extract as a mouthwash to kill the bacteria that cause bad breath.